The US Department of Justice and the Securities and Exchange Commission have launched an investigation into Microsoft over possible bribery and corruption in connection with software sales in Hungary. Linus Torvalds has started the development cycle of the Linux 4.19 kernel series, reported Softpedia News. Torvalds has published the first Release Candidate for Linux 4.19, two weeks after the Linux 4.18 kernel series was launched. “So two weeks have passed, and the merge window for 4.19 is over. This was a fairly frustrating merge window, partly because 4.19 looks to be a pretty big release, and partly just due to random noise,” said Torvalds. The report stated that Linux 4.19 will bring many changes with it, including updated graphics and networking drivers, core kernel and networking improvements, and updated filesystems. Independent Linux kernel hacker Con Kolivas has announced his 4.18-ck1 kernel as well as the latest release of his MuQSS scheduler. MuQSS, or Multiple Queue Skiplist Scheduler, remains the scheduler he is focused on and successor to BFS for improving the responsiveness/interactivity of desktop systems and more. MuQSS 0.173 is the new release and its primary change is compatibility with the Linux 4.18 kernel code-base. South African innovator in Internet of things (IOT) technology and strategy, IoT.nxt, joined a stellar community of global companies as a silver partner of The Linux Foundation, in June. “There are great opportunities to use open source software in IOT applications and we are excited to join the international community driving understanding and implementation of Linux developments and what this can deliver to companies and also individuals. Open source allows for incredible collaboration across companies, industries, organisations and individuals to solve particular technology challenges and drive value,” says IoT.nxt CEO Nico Steyn. One of the ideas we had in creating the compositing mechanism was to be able to scale window contents for the user — having the window contents available as an image provides for lots of flexibility for presentation. However, while we’ve seen things like “overview mode” (presenting all of the application windows scaled and tiled for easy selection), we haven’t managed to interact with windows in scaled form. That is, until yesterday. When an owner size is set, the window gets compositing enabled. The composite pixmap is allocate at the owner size instead of the current size. When no compositing manager is running, the automatic compositing painting code in the server now scales the output from the output size to the current size. Most X applications don’t have borders, but I needed to figure out what to do in case one appeared. I decided that the boarder should be the same size in the output and current presentations. That’s about the only thing that I could get to make sense; the border is ‘outside’ the window size, so if you want to make the window contents twice as big, you want to make the window size twice as big, not some function of the border width. With Keith’s virtual reality (VR) work for the Linux stack pretty much squared away, his latest X.Org improvement effort is around window scaling with desktop compositors. While X.Org compositors have already been able to deliver scaled window contents — such as from the “overview” on the GNOME Shell, alt-tab switchers, etc — the current architecture has not supported interacting with these scaled windows — such as proper input event handling. AMD used VMworld 2018 to announce the Radeon Pro V340 graphics card, which features two Vega GPUs. The Radeon Pro V340 features two Vega GPUs and a total of 32GB of HBM2 memory with SR-IOV/MxGPU virtual desktop infrastructure support intended for data-centers with visualization workloads and supporting up to 32 virtual machines with the graphics card (1GB vRAM per guest). The newest OpenGL extension being sought for inclusion into the graphics API’s registry is the NV_memory_attachment. Meet game-to-flatpak, an open-source shell script created by GNOME developer Bastien Nocera, which does one thing, to automatically convert commercial Linux game installers in various formats to Flatpak bundles for distribution across multiple Linux-based operating systems supporting the Flatpak universal binary format. While the script is in early stages of development, it already supports the MojoSetup installer, as well as the makeself installer used by GOG.com to package their games. It doesn’t support Wine-based game installers, nor DOSBox automagic wrappers, which won’t be supported in future versions of the script, so don’t ask for them, warns the developer. There are no official Google Drive native client available for Ubuntu/Linux. However, there are some unofficial apps, but they are, well unofficial. However, there are still some ways you can access your files in Google drive via Gnome Shell’s in-built Google account integration settings in Ubuntu. Ubuntu 18.04, 18.10 provides several online account connection features via settings manager. This short guide would explain the steps to access Google Drive/Google Account in Ubuntu via file manager. When Steam released its update for Steam Play, we knew that 27 games were whitelisted and confirmed by Valve be completely compatible with Steam for Linux. This was huge news, and it’s only getting better as gamers around the world continue to test games out to see what is working and what isn’t. According to Forbes and users that are doing the Lord’s work, we’re now seeing a more complete picture of what this updated WINE (Wine Is Not an Emulator) and updated DirectX compatibility layer means for gamers that want to enjoy a huge chunk of Steam’s library, but would prefer to stay away from Windows installations. When looking at the stats, you can see that over 2,000 individual games have compiled, many with multiple reports each, stating how stable the game is on their version of Linux. Valve pushed a new beta version of its Debian-based SteamOS Linux operating system to the brewmaster_beta channel for public testing, updating the graphics stacks like it promised last month. When it released the SteamOS 2.154 stable update last month at the end of July, Valve said that the update was kept small intentionally to test the waters before new kernel and graphics stacks upgrades are implemented in a major release of its gaming Linux operating system. As you might have read in our previous article, Planetary Annihilation and TITANS are being revived by a new team made up of some of the original developers. One of their developers has given an update on adding more multithreading. The already long list of Dota 2 heroes is now even bigger, as Valve have released an update with Grimstroke as well as teased another called Mars. If there’s one genre Linux has a pretty big hole in, it’s fighting games. Thankfully it seems we may get another, as Fantasy Strike [Official Site] is showing signs of coming over to Linux. Kontrakt [Official Site], a hyper-violent action-adventure is the next game from ShotX Studio that will have Linux support. Arriving on Steam sometime in Q4 of this year. The developers of the impressive action RPG Last Epoch [Official Site] that we tested during the Kickstarter have now put out the Alpha version. Continuing my quest to find some great co-op games, I recently tried out A Gummy’s Life which was a birthday gift from a reader. It’s actually hilarious! It’s basically a fighting game with some silly physics featuring various “gummies”, which each have different colours available to pick from when choosing. Plenty of different game modes like Hot Potato, King of the Hill, Team Deathmatch and Free For All so there’s some good variation to keep you happy. Realtek have been really helpful and open about the hardware, which is a refreshing difference to a lot of other hardware companies. I’m hopeful we can get the new plugin in fwupd 1.1.2 although supported hardware won’t be available for a few months yet, which also means there’s no panic getting public firmware on the LVFS. It will mean we get a “works out of the box” experience when the new OEM branded dock/dongle hardware starts showing up. GuixSD has a package manager that I like. I’ve used related technology through NixOS in the past and loved how easy it was to rollback problems, manage accounts and skip forward or backward instantly through installed package versions. Where I feel GuixSD let me down was in its limited hardware support (there are no non-free drivers or firmware) and its limited documentation. There are instructions for using GuixSD when all is going well, but nothing I felt was helpful when the package manager was not operating the way I expected. ReactOS, while a completely different operating system with its own kernel, installer and programs, ultimately had a similar problem: limited hardware support. The operating system’s Live edition did not work in either of my environments and I had to work around having a limited set of drivers. Another issue with ReactOS was the stability. The system tended to lock up if more than a few programs were running, or if I tried to cancel an intensive task like installing a new application. Coming five and a half months after version 8.5, Quirky Linux 8.6 is here as an incremental update consisting of various updated components and bug fixes, and it’s the last in the series as Barry Kauler plans to rebase the tiny GNU/Linux distribution on Canonical’s latest long-term supported Ubuntu 18.04 LTS (Bionic Beaver) operating system. Cloud computing giant Red Hat may be looking into using a blockchain-based system to track software usage. New marketing models for selling software on a cloud platform require new methods of tracking usage, and a blockchain may be able to efficiently track and store this information, according to a patent application released last Thursday by the U.S. Patent and Trademark Office. The filing outlines how a blockchain would track transactions across a given platform, where each transaction represents an instance of a customer using the company’s products. FusionLayer today announced that it has joined the Red Hat ecosystem as a RedHat ISV partner. The Red Hat cloud solutions supported by FusionLayer include OpenStack and Ansible. These two open source solutions are quickly becoming the industry standard by powering digital transformation at enterprises and service providers worldwide. Red Hat has taken yet another step to help enterprises adopt modern technologies and embrace digital transformation, with the introduction of Red Hat infrastructure migration solution. Although the enterprises want to digitally transform their business, but the legacy virtualization solutions hold back the innovation and IT advancement. This limits the path to hybrid cloud which spans physical, virtual and cloud-based environments. The costs of maintaining the existing infrastructure act as another barrier. That’s right, we’re talking about Tails 3.9, which is currently in development with a Release Candidate ready for public testing as we speak. As we reported a few weeks ago, Tails devs planned on implementing support for opening VeraCrypt encrypted drives in the GNOME desktop environment that’s used by default in Tails. Tails 3.9 promises to be the first release to ship with VeraCrypt support, but it also looks like there will be support for opening TrueCrypt encrypted volumes as well, straight from your GNOME desktop. Moreover, this release will integrate the “Additional Software Packages” feature into the desktop. I gave my first public talk on Saturday at FrOSCon 13. In case you’re interested in how we maintain Docker base images (based on Debian-slim) at REWE Digital, the video is already online (German). The slides are also available and a tarball, containing the slides and all files, so you do not have to copy the snippets from the slides. The relevant tool, container-diff, is provided by Google on GitHub. In case you’re interested in our migration to microservices, you can find the referenced talk given by Paul Puschmann at OSDC 2018 on Youtube (English). If you’ve any question regarding the talk don’t hesitate to write me a mail, details on how to reach out are here. deepin 15.7 GNU/Linux operating system has been released on Monday, 20 August 2018. It’s not so long after the previous 15.6 at June 2018. This updated version uncommonly brings lesser ISO size (now 2.3GB, previously 3.1GB) other than its RAM/CPU usage enhancements. So here’s the list of download links plus torrents. Happy downloading! The Feature Freeze stage is a very important step in the development of a GNU/Linux distribution, signaling the fact that the new features have already landed for the final release and that developers should now concentrate their efforts only on addressing critical bugs and other issues that might block the final release. At this point, there won’t be any major new features or updated packages except for those that fix bugs. However, there are currently more than 870 packages stuck in the cosmic-proposed repository, so developers and contributors are now urged to resolve any issues and free as many packages as possible until the beta release. Canonical once had an ambitious vision of making Ubuntu a dynamic operating system that would scale to desktop computers, tablets, and smartphones. Unfortunately, this goal was ultimately a failure — the Ubuntu Touch plan was abandoned. Later, the much-maligned Unity environment was killed off. Why did it all fail? Quite simply, as Microsoft learned with Windows Phone, it is pretty much impossible to compete with Google and Apple in mobile. Android and iOS are just too mature and too good. Ubuntu Touch had no real chance due to a lack of apps and device support. For those that still own devices compatible with Ubuntu Touch, all is not lost. You see, the UBports Foundation has picked up development. Today, the foundation releases version OTA-4, which is based on Ubuntu 16.04 LTS. It is chock-full of improvements, but unfortunately, despite the “OTA” name, you apparently cannot upgrade over the air. There are plenty of great Raspberry Pi fan sites, tutorials, repositories, YouTube channels, and other resources on the web. Here are my top 10 favorite Raspberry Pi blogs, in no particular order. Raspberry Pi Trading is offering a Power-over-Ethernet HAT board for the RPi 3 Model B+ for $20 that ships with a small fan. Linux Gizmos notes that the “802.3af-compliant ‘Raspberry Pi PoE HAT’ allows delivery of up to 15W over the RPi 3 B+’s USB-based GbE port without reducing the port’s up to 300Mbps bandwidth.” To purchase, visit here. Bad Android apps: How can Google’s new detection model help? Zowe is meant to provide interoperability and scalability between products. It’s also, IBM states, the first z/OS, the IBM mainframe operating system, open-source program. This month the OpenLDAP project celebrates its twentieth birthday! Its year of birth is 1998 when Kurt Zeilenga and others decided to consolidate patches that had been spread on mailing lists and news groups to improve the original standalone University of Michigan LDAP server code (slapd). After Kurt Zeilenga resigned, Howard Chu took over the role of the chief architect of the project. The OpenLDAP project traditionally follows the Unix design philosophy “one job – one tool”. Under Kurt Zeilenga’s lead, development of OpenLDAP as reference implementation of the “Lightweight Directory Access Protocol” (LDAP) primarily has been driven by Internet Drafts and RFCs. This focus on openness and interoperability turned the project into an important landmark in the landscape of network services, being supported by all major enterprise Linux distributions which offered OpenLDAP as a maintained component of their products. Researchers, scientists, academics, hobbyists, businesses — all of these groups are represented in the community of Qiskit, the open source framework based on IBM’s quantum computing programme that is opening up access to real quantum computing in the cloud for everyone. Quantum Information Science Kit (Qiskit) is just over a year old, and it followed up the IBM Quantum Experience, IBM Q Experience for short, a programme that put quantum computers on the cloud (for the first time) so researchers and developers could tinker with the almost brand-new field of computation. Please join us in congratulating Abhiram Ravikumar, our Rep of the Month for August 2018! Abhiram Ravikumar is an amazing contributor from Bangalore India and a long time Mozillian contributing as a Rep since November 2015. He is the so-called backbone of the Bangalore community keeping activities going in and around the region. Part one gave a short introduction of bitslicing as a concept, talked about its use cases, truth tables, software multiplexers, LUTs, and manual optimization. The second covered Karnaugh mapping, a visual method to simplify Boolean algebra expressions that takes advantage of humans’ pattern-recognition capability, but is unfortunately limited to at most four inputs in its original variant. Part three will introduce the Quine-McCluskey algorithm, a tabulation method that, in combination with Petrick’s method, can minimize circuits with an arbitrary number of input values. Both are relatively simple to implement in software. TenFourFox Feature Parity Release 9 beta 3 is now available (downloads, hashes, release notes). This version has site-specific workarounds for Github’s sudden hostility to TenFourFox (fixed using the same workaround we use for Imgur) and pages that use the new version of Cloudflare RocketLoader (by essentially defeating it). I also reduced idle time deferral for a couple rare crashes on the test systems that seemed to be from low memory and added a little tuneup for HTML5 parsing from Firefox 55. Of the security patches that landed in this version is a specific one for an issue that affects 10.5, but not 10.4. It’s more of an information leak than anything else and wouldn’t seem to be very common, but I was able to exploit it on the test network, so now it’s worked around. Our implementation is completely different from Mozilla’s largely for performance reasons since we only have two operating system flavours to worry about. OpenSSH 7.8 base source code was released on August 24, 2018. It includes many new features such as a fix for the username enumeration vulnerability, changes to the default format for the private key file, and many more. Additionally, support for running ssh setuid root has been removed, and a couple of new signature algorithms have been added. Org mode is a mode for the Emacs text editor. It’s designed to keep notes, maintain TODO lists, plan projects, and author documents with a fast and effective plain-text system. It’s particularly strong at scheduling tasks. The system includes a lightweight markup language for plain text files allowing lines or sections of plain text to be hierarchically divided, tagged, linked, and so on. Org mode is, in fact, a powerful system for organizing projects, tasks and notes in the Emacs editor. Major features include fast outline and table editing, TODO lists, agendas, scheduling and deadlines, cross-references and hyperlinks to arbitrary resources, as well as customisable document publishing in PDF and HTML from simple plain text markup. The Golang team released Golang 1.11 rc1 two weeks back, and now the much awaited Golang 1.11 is here. Golang 1.11, released last Friday, comes with changes and improvements to the toolchain, runtime, libraries, preliminary support for “modules”, and experimental port to WebAssembly. The feature’s name is Bubblewrap, which is a sandbox environment that the GNOME Project added to secure GNOME’s thumbnail parsers in July 2017, with the release of GNOME 3.26. Last year you’ll recall that the cable and broadband industry lobbied the government to kill off broadband privacy rules at the FCC. The rules were fairly basic, requiring that ISPs and cable operators clearly disclose what data is being collected and sold, but also provide working opt out tools for users who didn’t want to participate. The rules also contained restrictions requiring that consumers opt in to more sensitive data collection (financial), as well as some requirements that ISPs and cable ops adhere to standard security procedures, and quickly inform consumers when their private data was exposed by a hacker. In recent months, the cable industry has been showcasing how it’s simply not very good at keeping its websites secure. Comcast, for example, has seen three privacy breaches in almost as many months, with security researcher Ryan Stevenson discovering numerous, previously-unreported vulnerabilities that potentially exposed the the partial home addresses and Social Security numbers of more than 26.5 million Comcast customers. Code injection is common on Windows. Applications “inject” pieces of their own code into another running process to modify its behavior. This technique can be used for good or evil, but either way it can cause problems. The Android update landscape is a disaster that has plagued the OS for years. “Fragmentation” is a common complaint against Android, but some manufacturers are starting to take the necessary steps to correct this years-long problem. Is Hyper-Threading a Fundamental Security Risk? Ever since Intel introduced Hyper-Threading (known generically as Symmetric Multi-Threading), debates about whether or not to disable the feature have almost entirely revolved around its impact on performance. Back when the feature debuted, it wasn’t unusual for programs to misinterpret what it meant for a system to have a virtual CPU core as opposed to a second physical chip (back then, it was one core to a socket, no exceptions, and programs didn’t differentiate between a physical and a logical CPU core). As software and operating systems were updated, HT settled down and it’s less common today to need to shut it off to preserve performance. But in the wake of Spectre, Meltdown, and Foreshadow, serious concerns have been raised about the security implications of Hyper-Threading. At this perilous moment it might help for the historical aspect of this potential clash to be recognised, particularly by European states which share the habit of dwelling on the past. In the UK’s search for lost empire, for example, key events of fairly recent vintage, the Dunkirk episode and the aerial Battle of Britain in 1940-41, are endlessly revisited as signposts of greatness and demonstrations of national character. That tendency to look beyond the immediate context ought to give British commentators the imagination to grasp the importance of past events in Iran. A prime instance is the downfall of Iran’s prime minister, Mohammad Mossadegh, in 1953, orchestrated by Washington and London – a coup which climaxed sixty-five years ago this week (see “The Iran complex: why history matters”, 26 January 2012). It was done in retaliation for Iranian attempts to take control of their own oil industry, then held by western states, principally Britain. Its success ushered in the quarter-century reign of the autocratic Shah, whose regime Washington viewed as an essential prop in the regional alliance constraining Soviet ambitions at the height of the cold war. “John McCain’s legacy represents an unparalleled example of human decency and American service,” tweeted the candidate upon McCain’s death, which, for anyone who cares about the late Arizona senator’s relentless push to inflict military violence around the world at every opportunity, is incredibly offensive. McCain was easily the single most virulent warmonger on Capitol Hill, so praising him and his legacy as exemplary of human decency necessarily clashes with the “Peace Economy” platform that has had so many of Ocasio-Cortez’s supporters so excited. 79-year-old Bill Oxley, ex-agent of America’s Central Intelligence Agency (CIA) is re-writing the history of the death of reggae legend Bob Marley, claiming he actually killed the legend. Marley tragically died aged only 36-years-old, leading music lovers world-wide to grieve as the Jamaican icon’s life and career were cut short following a four-year battle with cancer. It is well known that late iconic musician Bob Marley died on May 11, 1981 from complications traced to cancer. In July 1977, Marley was found to have a type of malignant melanoma under the nail of a toe. Contrary to urban legend, this lesion was not primarily caused by an injury during a football match that year, but was instead a symptom of the already-existing cancer. On Liberty Nation’s Truth TV, join Leesa K. Donner and Joe Schaeffer as they dig deep into why the left now has the hots for the CIA despite years of calling out the Covert State. Mueller would have us believe that his indicted Russians created Guccifer 2.0 to deflect blame for the DNC hack away from themselves by having the online persona claim responsibility but deny being Russian. This plan seems, not to put too fine a point on it, kind of stupid. Since a Russian spy couldn’t be expected to admit his identity, it’s hard to imagine G2’s denials would have had any credibility. And, since G2’s taking credit for the hack would attract more attention to it, it seems just as likely as not that such a plan would have increased speculation that the Russians had hacked the DNC. Mueller also accuses his 12 indicted Russians of using the G2 identity to pass documents to WikiLeaks. Yet Mueller somehow neglected to mention that G2 himself boasted of being a WikiLeaks source several times; starting, once again, with his very first blog post. Mueller’s silence about G2’s multiple confessions to one of his indictment’s main allegations, though contemptible, is at least understandable. Publicly confessing to being a WikiLeaks source is, after all, the very last thing a Russian spy who secretly was one would do. Mueller couldn’t mention G2’s confessions for the same reason he couldn’t mention all the evidence G2 planted to give the impression that he was a Russian spy. Both are obviously self-refuting and, hence, make a mockery of Mueller’s allegations, which he made knowing he had no power to extradite any of the 12 indicted Russians and, hence, that none of his misrepresentations will be exposed in court. The clues G2 left connecting himself to Russian espionage and his repeated shout-outs to Julian Assange are as flagrant and gratuitous as they are self-refuting. And, they are equally inexplicable unless the truth is the exact opposite of what Mueller alleges and G2 was created to poison Assange’s reputation by falsely making him out to be in league with Vladimir Putin. But, the other two important items we’ve seen (and about which Mueller remains silent)—G2’s possessing the Trump opposition research file and Assange’s June 12 announcement that Clinton campaign emails were forthcoming—together shed a new and revealing light on the purpose behind that June 14 Washington Post story that first brought the now infamous Russian hack of the DNC to the world’s attention. National Security Agency (NSA) contractor Reality Winner, 26, was sentenced last Thursday to five years and three months in federal prison for leaking classified documents to the press which contained allegations of Russian manipulation of the 2016 presidential election. Winner is the first person to be tried by the Trump Administration under the Espionage Act and according to her attorneys her punishment will be the longest sentence ever imposed for leaking classified information. She pleaded guilty in June at a federal courthouse in Georgia as part of a plea deal to reduce her sentence. Prosecutors from the Justice Department did not seek the maximum sentence of 10 years imprisonment and instead recommended a 63-month penalty. Winner, who was prosecuted under the Espionage Act, accepted a plea deal that sends her to prison for 63 months for leaking to the press in 2017 information that exposed a Russian cyberattack against U.S. voting systems. It’s the longest sentence ever in federal court for leaking government information to the press. Imagine Milton Friedman and Robinson Crusoe together, reminiscing about Burning Man, on a remodeled off-shore oil rig. Like the image? Welcome to seasteading. The latest in a long line of libertarian exit strategists, seasteaders aim to create self-governed, private floating platforms on the ocean. In an era of Silicon Valley excess, techno-libertarian optimism, and mainstream political malaise, exit strategies are proliferating. At the 2017 Startup Societies Summit, held without a hint of irony at the City College of San Francisco (attendees were asked for charitable donations), an array of libertarian exit strategies were on offer. Among other options one could, for example, engage in “crowdchoicing,” captured best in the Free State Project which aims to mobilize 20,000 participants to relocate to New Hampshire by 2020 where they will, according to the FSP webpage, “create a society in which the maximum role of government is the protection of life, liberty, and property.” Others advocate non-territorial strategies. A younger generation of market libertarians—steeped in a vocabulary of “disruption,” “decentralization,” and “freedom”—are exploring exit strategies that embrace an encrypted existence that escapes the parameters of the state through the use of various digital technologies and encrypted mediations. (Their recent arrival in struggling Puerto Rico may be a sign of what is to come.) Its advocates eschew territorial escape in part because they already see a world in which the mediating structures of government, media, and business are collapsing. At its most optimistic, such a strategy looks toward a future of “social singularity,” a post-political and transhumanist world in which individuals can thrive entirely through decentralized, technological, and cyborgian networks. Meetings of the Maine Commission on Governmental Ethics and Election Practices do not usually give way to moments of high drama. But supporters of public financing breathed a deep sigh of relief on Thursday after the bipartisan commission’s four members ruled to release $3.5 million in previously held-up funds to 120 candidates in races for the state House, Senate, and Governor. This decision was only the latest chapter in a long-running partisan saga about Maine’s Clean Election Program. First passed in 1996 by citizen initiative, the voluntary program provides public funds to candidates for governor and state Legislature if they raise a threshold amount in $5 donations. In exchange for public financing, participants agree to certain restrictions, including spending limits and a prohibition on using other funds. In addition, qualifying candidates in general elections against privately financed rivals can receive supplemental funding provided they continue to collect small donations. Public financing regimes like Maine’s are critical engines for democratic participation in the age of super PACs and dark money. They lower barriers to entry for candidates who may not have access to large pools of money and encourage candidates to spend time courting ordinary citizens instead of behind-closed-doors dialing for dollars from well-heeled special interests. There’s nothing original about this metaphor, which quite likely isn’t even a metaphor. It’s been there all along: Pulitzer-winning reporter David Cay Johnston, who has followed Donald Trump’s career for four decades, has written extensively about Trump’s longtime connections to organized crime, as have numerous other journalists, including Salon’s Heather Digby Parton. Those connections clearly go back to Trump’s early days of doing shifty deals in the bottomed-out market of 1970s Manhattan real estate, where the only way to build anything, buy anything or make anything happen was to work with the made men and their allies. This Editorial Board represents many different political ideologies, none of which will ever dictate the opinions that members of the tri-campus community choose to express through our Viewpoint section. The column in question met our standards of publication in that the author did not use ad hominem attacks or profanity in his writing, and he included citations to his sources. As long as the column remains relevant and continues to adhere to our standards of publication, for us to not run the column would be political censorship, which we do not practice at The Observer. Just as in Alice in Wonderland: the verdict before the trial. The Freedom Center was judged guilty of “hate crimes” without a chance to protest and its online fundraising was blocked. Because on line fundraising is the lifeblood of our organization, this was an existential threat to our future. We were mobilizing for a costly legal proceeding against Mastercard when, on Friday afternoon, four days after the attempt to destroy us, WorldPay and MasterCard backed down and informed us they were restoring our online services and donations. Google has faced sharp criticism, including from its own employees, for its efforts to rebuild an internet search presence in China after quitting the country eight years ago over censorship issues. An internal crisis is unfolding at Google as the tech giant, which once operated with the motto “don’t be evil,” plans to assist China in the state-sponsored suppression of information. According to leaked documents reported by the Intercept, Google has created a censored version of its search engine in China that would, among other things, block certain websites and search terms about topics such as human rights, democracy, and freedom of expression. engine for the Chinese market that would function in compliance with Beijing’s strict rules on censorship. In an organisation that talks up transparency, it is ironic that only a handful of the company’s 88,000 employees knew about the project. When some of them caught wind of it, they leaked the story to an online news site, The Intercept, which broke the news and put Google’s top brass on the spot. Google has ventured into China before but eventually left in 2010 because it couldn’t live with the censorship rules. There was a time when Google’s corporate slogan was ‘”don’t be evil”. That altruistic philosophy has since been amended from its code of conduct to “do the right thing”. On September 24, Joe’s Pub will present Banned Together: A Censorship Cabaret- a celebration of songs and scenes from shows that have been censored or challenged on America’s stages, created to raise awareness around issues of censorship and free expression in the Theater. The event will feature performances of featured selections from CABARET, CHICAGO, 3C, RENT, INDECENT, and ANGELS IN AMERICA, among other notable works, with contextual commentary by writers John Weidman and JT Rogers. In 2018, Banned Together will be performed during Banned Books Week, September 23 – 29, in fifteen cities across the United States, including Chicago, LA, Atlanta, Boston and more. Click here for a full list of cities. Nowadays, smart devices have taken the wicked roads, contrary to the original plan of helping the citizens of the world. A few days back, we heard how remotely controlled home devices, doorbells, and thermostats are being used to inculcate fear among domestic abuse victims. Now another acute case of smart devices has come to light where a mere modern electricity meter has been found to interfere with home WiFi routers and many other internet devices. In February, details of the “Network case” – in which 11 Russian anarchists and anti-fascists are being investigated on charges of creating a terrorist organisation – became public. This organisation never existed, and even its name is a figment of an FSB officer’s imagination. The number of criminal cases for reposting “extremist” memes online is only growing (OVD-Info reported 170 such cases in 2017), and this practice is developing quicker in the provinces than in the big cities. Recently, in the Siberian town of Barnaul, there have been three cases opened against users of social networks. A tiny unincorporated town in Michigan continues to draw national heat, thanks to the police department’s apparent abuse of the Defense Department’s 1033 program. This program allows law enforcement agencies to obtain military surplus — which can include armored vehicles, aircraft, and weapons — for next to nothing through its Law Enforcement Support Office (LESO). This program has contributed greatly to the militarization of US police forces, allowing officers to dress up like soldiers while waging the War at Home on the constituents they supposedly serve. What happened in Thetford, however, wasn’t a sudden ramping up of military gear/tactics. Instead, the Thetford PD — which boasts two officers — simply took the 1033 program for an extended ride. Chief Robert Kenny managed to obtain 950 items through the 1033 program, valued at over $1.1 million… at least according to his own, very conservative estimate. Thetford Township Police Chief Robert Kenny was arrested this week in connection with an investigation into surplus military equipment his department received. Genesee County Sheriff Robert Pickell scheduled a press conference for Thursday morning to discuss “the arrest and charges” Kenny is facing. Court records show Kenny is charged with embezzlement and obstruction of justice dating back to 2012. The sheriff’s office has been investigating Thetford Township’s use of more than $1 million worth of surplus military equipment obtained through the Law Enforcement Supports Office over the past decade. Kenny obtained the equipment, including a large forklift down to several used sleeping bags, on behalf of the township’s two-person police department. An analysis making the rounds in Chinese media has identified dozens of former Huawei patents that now appear on Qualcomm’s list of Chinese standard essential patents (SEPs). The two companies, which are still working to resolve in a royalty payment dispute, transacted hundreds of assets in the aftermath of Qualcomm’s settlement with the National Development and Reform Commission (NDRC) in 2015, according to USPTO records. On July 30, Qualcomm disclosed its updated version of Chinese cellular essential patent list. The full list includes 2,240 patents under 1,000 families, with 1,600 grants and over 600 applications. The World Intellectual Property Organization’s committee seeking to find solutions against misappropriation of traditional knowledge opened this morning. While delegates are expected to negotiate wording of a potential treaty, the fund allowing indigenous peoples to participate in the discussions is empty with no foreseeable new donors, described by the chair as a historical situation. The committee is also trying to agree on recommendations for the upcoming WIPO General Assembly next month. On core issues, such as what the protection should cover, who would benefit from it, and under which conditions, delegates still have to find common positions. The music industry has been fighting issues like piracy and copyright infringement for a very long time now. After giving up on the pursuit of direct infringers due to bad publicity, and deciding not to target the companies that create software and websites for online file-sharing, the recording industry is now focused on establishing copyright liability that would turn ISPs into copyright police. Are the so-called ‘inventors’ walking around and entering random buildings in an effort to identify “infringers”? THE EPO suffers severe patent quality problems, but almost nobody talks about it anymore, certainly not António Campinos. He pretends that no such issue even exists. Other people are afraid to even bring up the subject and as a result, inevitably, every single day the EPO grants patent monopolies which oughtn’t have been granted. “So an alternative title for this patent would be “Added Window”.”We’re not neglecting EPO coverage; there’s just not very much to report. We aren’t about to start a “Stupid European Patent of the Month” series (like the EFF’s in the US), but there certainly isn’t a lack of questionable European Patents (EPs), such as a recent one on chewing gum. 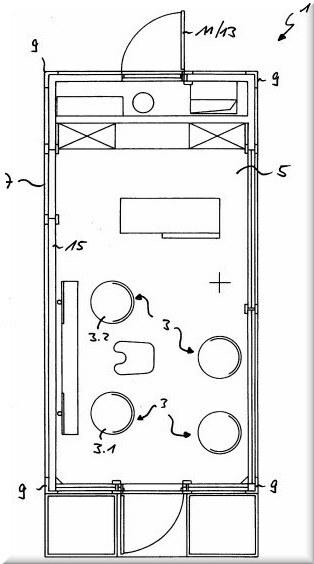 Take a look at this patent titled “Hairdressing salon and mobile building for the same” (assigned to Bernd Andrich and Ralf Dieter Mehlmann) and look at the picture (above). Well, this grant from August 2016 and information about it circulated internally in the past. It’s about a mobile hair salon. The inventiveness (improvement over the prior art) is apparently a window. Yes, a window. Because adding a window to the room is apparently not obvious to the skilled person. So an alternative title for this patent would be “Added Window”. IBM’s USPTO-granted patents continue to be a laughing stock. Many of these are software patents and the Patent Trial and Appeal Board (PTAB) throws away a lot of them. Technology multinational IBM has taken a licence to a patent at the centre of a dispute with a San Diego-based provider of security solutions in the internet of things (IoT). ZitoVault, which had brought a patent infringement lawsuit at the US District Court for the Northern District of Texas (Dallas), announced the settlement on Tuesday, August 21. The San Diego-based company sued IBM back in April this year, accusing it of infringing US patent number 6,484,257, which covers ZitoVault’s CryptoSale software. The patent covers systems and methods that “provide a scaleable way to maintain a number of cryptographic sessions”. Also see “ZitoVault Licenses CryptoScale™ Patent to IBM”; this was done by threats and pressure — the same thing Microsoft has been doing to FOSS for about a decade, e.g. shaking down Android/Linux OEMs.